Greensboro, NC – Organizations coping with smaller staffs and fewer resources need greater personal accountability from their employees, but it’s often difficult to achieve. The Center for Creative Leadership (CCL®) is offering tips on how to foster this valuable workplace skill in its 50th practical and easy-to-read leadership development guidebook. 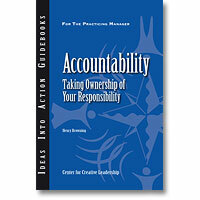 The recently published “Accountability: Taking Ownership of Your Responsibility” is the newest in the Center’s series of Ideas Into Action Guidebooks, which offer practicing managers information on topics including coaching, active listening and managing conflict. CCL published its first Ideas Into Action guidebook in 1998, and the series has been distributed globally. The accountability guidebook clearly and concisely explores why employees often don’t take ownership of their decisions, play the blame game or are crippled by fear of punishment. It offers ways for organizations to develop a culture of accountability — a willingness to face the consequences that come with success or failure — that begins with top management and spreads to all levels of managers and employees. The guidebook, based on five years of study with major companies around the world, also features an accountability scorecard that can help managers figure out the problems in their organizations. Offer support to employees from senior leadership, direct supervisors and their work teams. Create an environment that tolerates mistakes and individual differences. Give employees freedom to accomplish a goal or task, promoting ownership in the process or results. Provide access to all information needed to make decisions. Offer some control over resources. Be clear about to whom an employee is accountable and for what outcomes.